Hauler, Tow Truck, SUV, Carryall, Limousine. We're talking Suburban, Chevy Suburban. No use to argue about facts. If' you're an active car guy or girl, you need one. Because of capacity and volume. 6 person on tour with a V8 in the trunk and a car on a trailer? No problem. Still luggage space! Besides, you'll get a comfy ride too. Drive around with the 454 big block inside a car park with window down and just enjoy. The sound. From that 7,4L engine. So we bought ourselves a rust free 2500 Suburban from 1995 to as a tow truck for our 449 Amazon land speed racer. Felt good. Even great. Doesn't look too bad on Salt. Work's well in all kinds of deserts and Cina likes them too. Buying an old Burb introduce you to new people. Which is good. Always. Well, actually we had a few. Nothing major, but still, a few. Before we even signed the line, the fuel pump had to be changed. At the dealers expense. A new fuel pump is relaxing to have. Really. Because fuel supply is a good thing. 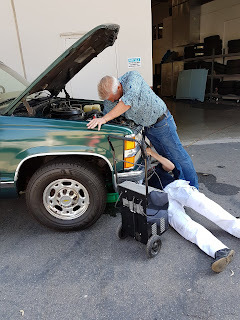 Later we've learned that a sealed and perky coolant pump with some fresh new hoses also were needed to make our long term marriage a success story. So we changed that. As a morning gift our green lady got new tires and a full service as well. Some cars are hard to please. 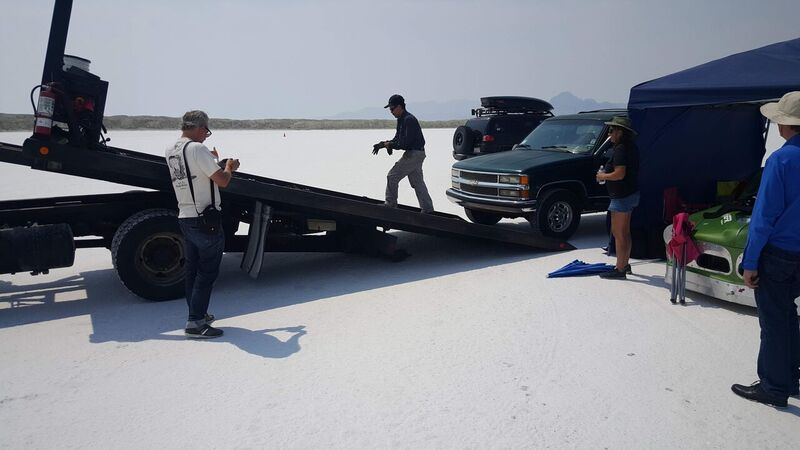 Obviously a tow ride over the salt flats was needed to keep up the good hauling mode. And you can't blame a 23 year old to ask for a new starter motor either. She got it on a Sunday in Wendover, NV. In fact the old Burb was so exited over this place so it burned the alternator outside the garage doors in pure joy. But still, when it's eating up endless road in Nevada, cool as can be with refilled refrigerant, perfect oil pressure and steady coolant meter. Then it still feels really good.